George Washington only spoke English (and famously required an interpreter in his dealings with French and Dutch colonists), but many of his successors have been proficient in more than one language. Even Barack Obama had been known to show off the conversational Indonesian he picked up while living in Jakarta with his parents in the late 1960s. Here are other multilingual U.S. presidents who weren't lost in translation. Nearly two decades before he became President, John Adams was appointed Commissioner by Congress and sent to Paris, to join fellow diplomats Benjamin Franklin and Arthur Lee in negotiating a military alliance with France. He arrived, unable to speak a word of French, in April 1778, and remained there for more than a year (largely spent feeling overshadowed by Franklin) before returning home the following June. Later in 1779, Adams was appointed “Minister Plenipotentiary,” and sent back to Europe by Congress to rejoin the negotiations in Paris. This time, however, he was determined to improve his language skills—and after several months’ service, he eventually learned to speak fluent French. "As to Spanish, it was so easy that he [Jefferson] had learned it, with the help of a Don Quixote lent him by Mr. Cabot, and a grammar, in the course of a passage to Europe, on which he was but nineteen days at sea. But Mr Jefferson tells large stories." Although his claim to have mastered Spanish in a little under three weeks is probably a stretch, the fact that Jefferson was fluent in the language is entirely true. The third U.S. President also studied French, Italian, Latin, and Greek, while his library at home reportedly included dictionaries of Welsh and Arabic. Studying the classics was once a fundamental part of every child’s education, and many of America’s earliest presidents had a good understanding of Latin and Greek. However, James Madison became so proficient in both languages that he customarily added his own corrections and annotations to his copies of Latin texts by classical scholars and philosophers. When he was 10, John Quincy Adams accompanied his father, John Adams, to Europe. He attended schools in France and the Netherlands and become fluent in both French and Dutch. The sixth U.S. president also honed his language skills by routinely translating a page of Dutch into English every day. When he was appointed Ambassador to Prussia in 1799, Adams applied the same technique to Prussia’s native language, German, and mastered that as well. He may well have been the first American-born president, but Martin Van Buren is also the only president in history whose first language wasn’t English. He was born in Kinderhook, an isolated village in the east of New York State, where most of the population—including both of Van Buren’s parents—spoke Dutch. It wasn’t until he began attending the local schoolhouse that Van Buren learned to speak English in the late 1780s. Like James Madison before him, James Garfield wasn't unusual in having a working knowledge of both Latin and Greek. But as America’s first ambidextrous president, Garfield took his talents one step further with a mind-bending and bizarre party trick. Legend has it that when asked a question, he could reportedly write the answer in Latin with one hand, and in Greek with the other. As well as being highly proficient in Latin (he and his wife, Lou, translated a 16th century guide to mining and metal-smelting into English in 1912), Herbert Hoover also spoke fluent Mandarin Chinese. The son of a Quaker blacksmith picked up the language while living and working in China as a mining engineer at the turn of the 19th-20th century. During his presidency, he and Lou would hold their private conversations in Mandarin to prevent their staff from listening in. 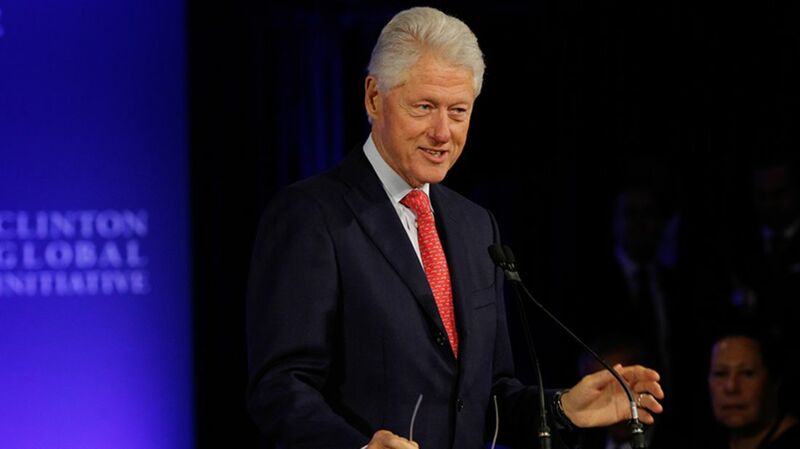 Bill Clinton was required to study a foreign language as a student at Georgetown University in the mid-1960s. Because he was “interested in the country and impressed by the clarity and precision of the language,” the 42nd U.S. president later explained, he opted for German—and used his knowledge of the language to deliver a memorable speech at the Brandenburg Gate in Berlin in 1994.